An early-access role-playing game, coming to Steam on January 11th. Next Up Hero’s developers, Digital Continue, aimed to create “…an impossibly hard 2-D action game,”1 with a strong community focus, that paid homage to the old top-down arcade games many people grew up with. So far in development, however, Next Up Hero feels more awkward than it does difficult, as while the game runs smoothly and has very crisp and colorful graphics, mouse and keyboard controls do suffer in design. The most promising part of the game is its unique twists on the current RPG genre. The first things players will notice when booting up Next Up Hero is that it has its own launcher, similar to games like SMITE or League of Legends. You are required to sign up for a third-party account with the games publisher, Aspyr, before being able to access the games servers. The launcher also allows you easy access to feedback, support, and the companies social media pages. As you enter the game, you are met with a very light and vibrant color palate, and a game that runs as smoothly as any AAA title. The gameplay itself is where you may start to run into issues. When first entering the game, its reminds you of the difficulty you will be facing, and to prepare for countless deaths to come. It also displays a warning that the game was meant to be played with a dual stick controller, and that using a mouse and keyboard will only make the game even more difficult. Many people are fans of this difficult style of gameplay, which led to the success of the Dark Souls series, and are excited to take on the challenge. Players deciding to use a keyboard and mouse will more than likely feel like the game is more awkward to play, rather than difficult though. The movement and attacking are what you would expect from most PC games; WASD to move and using the mouse buttons for your primary and secondary attacks. The attacking is what will cause the biggest issue for many players though. Many games with this style of gameplay allow for the player to move and aim/fire independently of each other, while Next Up Hero causes the player to fire in the direction the Hero is moving. Though the game allows you to hold shift to aim where the mouse is currently looking, it slows down your movement, and makes strafing and survival much more difficult than it needs to be. The game is supposed to be difficult, but outside of controls, the gameplay itself was not all the bad. When playing through the game’s campaigns, known as “ventures,” you are met with a large variety of enemies. Most of these enemies have very predictable attack patterns, and will not cause you any issues. You will more find yourself dying to the enemy’s abilities, such as spikes in the ground or a fast initial charge, rather than their standard attacks. Even the mini-bosses have very predictable attack patterns, and you will find yourself able to challenge them easily. The difficulty in the game comes from the lack of healing. No matter how good a player is, everyone will be hit by stray bullets or traps every now and again. Without being able to heal, these little incidents add up quickly. The only saving grace for your run through is the games spectating mode, which allows outside players to watch your venture, and provide healing and assistance as they see fit. This, and many of the games other unique gameplay characteristics, are where the game really starts to stand out from others in the RPG genre. Digital Continue was successful in making a game that is heavily community-based. When choosing what venture you want to take on, you are given the option to create your own venture, or continue a venture that another player had started and died in part way through. When your hero dies in a venture, you leave behind a ghost of your hero, known as an echo, that helps the next player during their gameplay in several ways. These echoes will follow the current players hero and help defeat enemies, can have messages containing helpful information from previous players, or the player can sacrifice the echoes to summon ancients, who are strong allies able to support the heroes with powerful buffs of firepower. This is a very fun mechanic that is unique to Next Up Hero, and makes it so the community works together to try to overcome ventures. 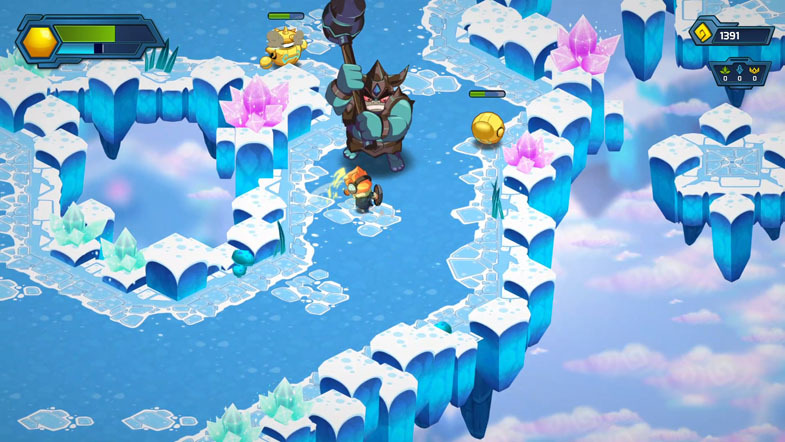 The game also has the characteristics of a traditional RPG, with nine different heroes, each without their own weapons, abilities, and playstyles. You can upgrade these heroes with prestige, the games currency which can be earned from completing customizable challenges, or by defeating monsters. You can also collect tokens dropped by the monsters you defeat, which allow you to add special characteristics to either your hero or their attacks. There are rare versions of each monster, which you have a slim chance of facing in your ventures. You can raise the chance of facing the rare versions by paying a small prestige fee when creating a venture. The rare versions of the monsters drop their own unique tokens, which add even more powerful abilities to your heroes than the normal versions. Grinding for these tokens will make the harder ventures more accessible, and adds plenty of replay value to the game.